Pete Hanshaw: Maya Exporter: Tabs and Tools! 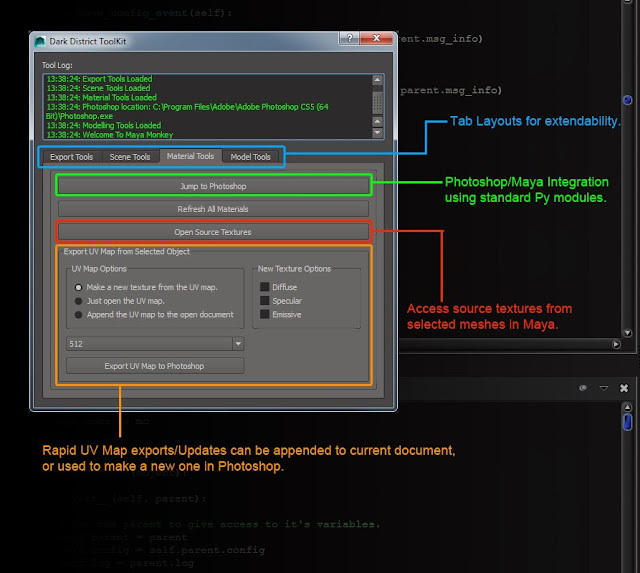 Maya Exporter: Tabs and Tools! I've been chipping away at my Maya Exporter and have a few Photoshop functions tied into it now, along side the original exporter functionality. Maya-side functions and Photoshop functions have been split into separate classes and files from the GUI, which has made keeping track of the code a lot easier. The GUI is built using the Pyside QT Libraries, which comes standard with Maya 2014. Next on the list, adding the option to load different project environments.